Hurray! The long and dark winter is finally over. Our nights are getting shorter and we finally get to see the sun more than just one time per week! Now that Spring is finally here, it’s time to put away those gloves, scarves and warm winter jackets and hit the great outdoors. Here are my top 5 activities which I like to undertake with the kids in Prague during this time of year. Spring is arguably the best time to pay a visit to Prague Zoo (which was incidentally voted the 7th best zoo in the world by Forbes Magazine in 2008). The temperatures are mild, everything is in bloom and many of the animals (except for perhaps the penguins and polar bears) are happy to be outside again. Apart from all the wonderful animals, there are train rides, several playgrounds for kids, a great wooden viewing platform and for the brave, an old-fashioned but safe chairlift which offers spectacular views over the zoo as well as western Prague. In the Children’s Zoo area kids can hand feed the goats, ride ponies, pat sheep, pigs and rabbits and have close encounters with other domesticated animals. There is also a cute tram ride for kids, a small pond for paddling on hot days and an outdoor theatre for regular performances. If you plan to visit the zoo more than 2 times in any 12 month period, then the annual membership ticket priced at only 1200 CZK for 2 children and 2 adults is an absolute must. When the sun is shining and the weather is fine, this is a wonderful way to just sit back, relax and take in the beautiful sites of the city from a different perspective. 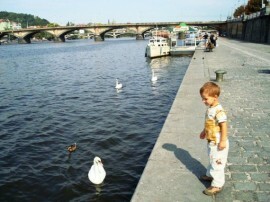 Most children find boats quite entertaining, and the changing scenery will usually keep them interested for some time. There are many different boating companies and time tables on offer. One of these is Rasinovo Nabrezi (Rasinovo Quay). 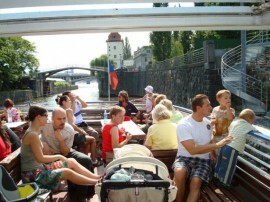 You will find it on the river bank between the famous Dancing House (at the end of Jiraskuv Bridge) and the Vysehrad tunnel (in between Jiraskuv and Palackeho Bridge). I always know that spring has finally come when Prague’s red historical trams start rattling through the streets again. It’s a beautiful sight and sound and on all weekends from April to November, for only 35 CZK (20 CZK for children), you can hop-on or hop-off this Nostalgic Tram Line No. 91 at dozens of stops throughout the city. You can also combine your Nostalgic Tram Line ride with a visit to the The Prague Public Transport Museum (Muzeum MHD). It is located on the premises of the former tram depot of Stresovice in Prague 6. It houses a unique collection of dozens of period public transportation vehicles going as far back as 1875, the year in which the first ever tramway, pulled by horses, started to operate in the streets of the then Royal Capital City of Prague. My boys never tire of visiting the “Tram Museum” nor the special ride on “No:91”. Although not strictly made out for kids, Prague’s Botanic Gardens do offer children a nice area to run around in while us adult folk feast our eyes on the lovely flowers and trees that change with each season. In Spring, in particular, everything is in bloom and the first ‘sakura’ or Japanese cherry trees come to life. According to the Shinto symbolism of plants, these trees represent the perfection of spring. The Botanic Gardens are divided into several sections and there are many species of flowers, trees and shrubs to be viewed. The gardens are a hive of activity with many exhibitions, workshops (sometimes even specifically for children) and public events organized all-year-round. A visit to the nearby tropical green house (Fata Morgana) is also a must. Simply follow the signs posted throughout the gardens. For more detailed information on the botanical gardens including maps and directions please click here. The gardens are open all year round from Tuesday to Sunday starting at 9am. During the warmer months of May to September the closing time is at 7pm. What a logical and great thing to do! It’s no longer cold and rainy all the time, so gather up some sand toys and let the kids run loose at one of the many, many wonderful outdoor playgrounds scattered throughout Prague. For a detailed list of the best playgrounds in Prague (over 35 are listed) click here.